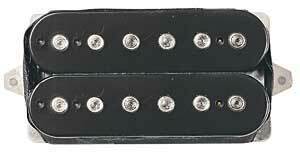 Order your DiMarzio PAF Humbucker Pickup from AMS and enjoy Fast & Free Shipping. Get the Best Deal with our Lowest Price Guarantee & Great Customer Service! Classic vintage tone - a smooth, almost voice-like quality - the DiMarzio PAF Humbucker Pickup has that intangible swell to the notes after attack. It possesses vintage output, and breathes freely with an open, warm character. Played flat-out through non-master volume tube amps, the PAF recreates the deep character of the great plug-in, turn-up and wail school of tone. Modern potting techniques and tight, consistent winding eliminate squeal and microphonics common to the originals. Here is solid tone for both neck and bridge positions. Balances well in the neck with hotter bridge humbuckers. There are two basic types of vintage humbuckers: those that have a hotter, like new tone and those that have a softer, aged sound. The Air Classic has the softer sound, and the PAF is a little tighter and tougher - very useful for cleaning up muddy-sounding neck positions. Its also good as a bridge pickup combined with neck & middle single-coils: not loud enough to overwhelm them, and bright enough to blend well.